Raise your hand if you have a big 'o rectangular mirror hanging in your bathroom? You know, the one the builder slathers glue on the back of and slaps it right onto the wall without thinking of the DIYer who's going to want to remove that bad boy and put up something different. If removing the mirror and facing the possibility of damaging the drywall is a concern, then I've come up with a great alternative. Glue a mirror on top of it! 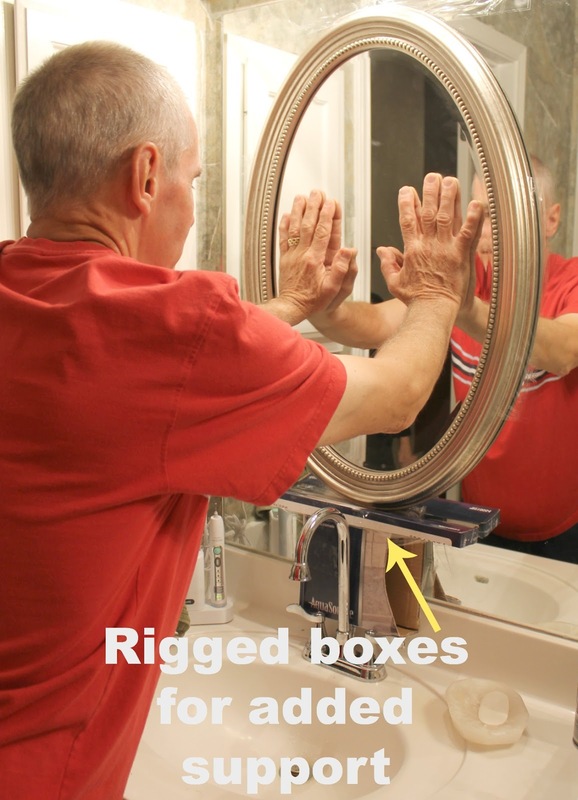 This simple solution came to mind when my parents were trying to figure out how to fix a weird blotch on their mirror. I asked them to be my guinea pigs and let me try covering it up with another mirror. The solution sounded intriguing and required minimal work, so I was given the green light. 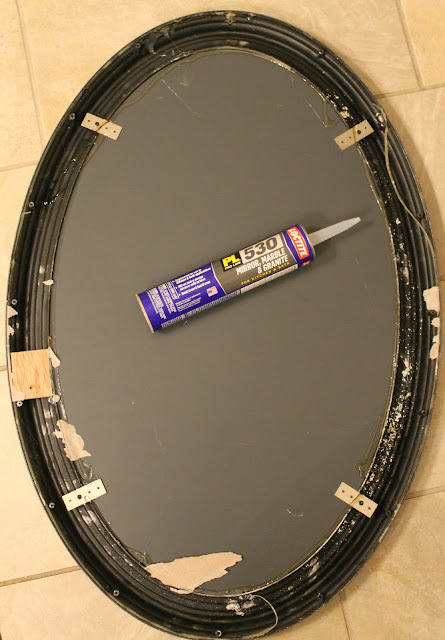 We found mirrors at Hobby Lobby that were light weight and looked like the backing could be removed easily. Winner! We unscrewed a few screws and ripped the back right off. No returning the mirrors at this point...I was really hoping my idea worked. We needed the mirror exposed for best adhesion...mirror on mirror. Found at any home improvement store. Make sure you pick up a caulk gun while your there, too. Caulk around the edges and don't be afraid to be extra generous with your portions. Once the edges are well covered, go crazy in the center of the mirror too. Now press and pray (that it doesn't fall). We concocted a support system of boxes to help hold the mirror until it had time to adhere fully. Helpful hint...make sure you check the height before gluing the mirror in place. What seemed high enough for me, cut my dad's head off! Make sure it's placed high enough for a tall person to look in comfortably. Let's wrap things up with a little Before/After action, shall we? I'm pleased to report it's been several months since this project was completed and their mirrors are still happily hanging in their places. Perfecto!! It adds so much to the plain ole builders mirror and hides that weird spot so well. Great idea, Dana! so glad they are still happily hanging! 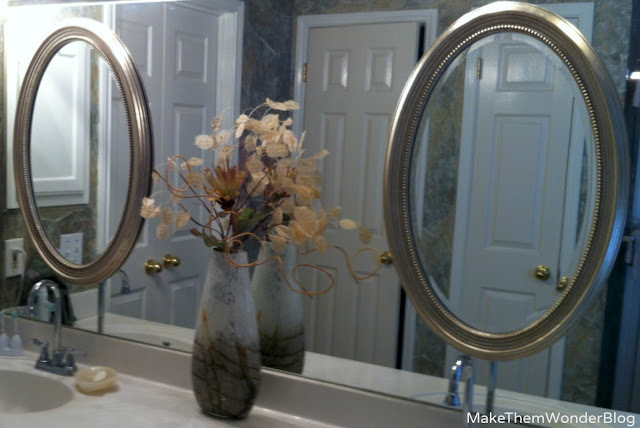 they look great and add style to an otherwise lackluster wall mount mirror! That looks really cool, too, Dana. Clever and chic solution to the blotch! I wish i had seen this when we lived in our condo. Looks great! It's been a few years....Wondering how the adhesive held up over time? 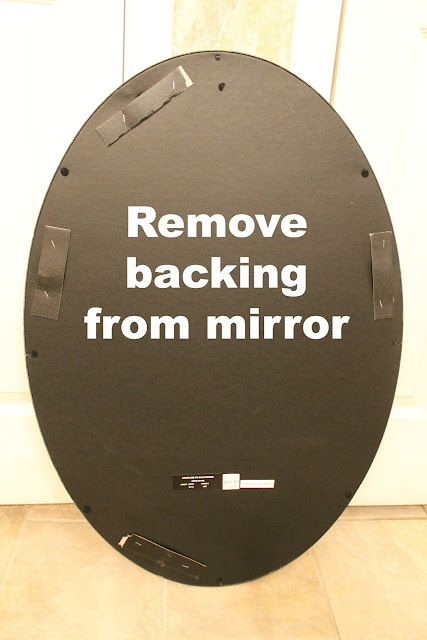 There are many tips which should be focussed on the while attaching the irror on the mirror as you have to measure the length of the mirror which you wanna paste and according to that you can cover it and while pasting it you should be very careful with the measurement otherwise it could lead you in the big problem.